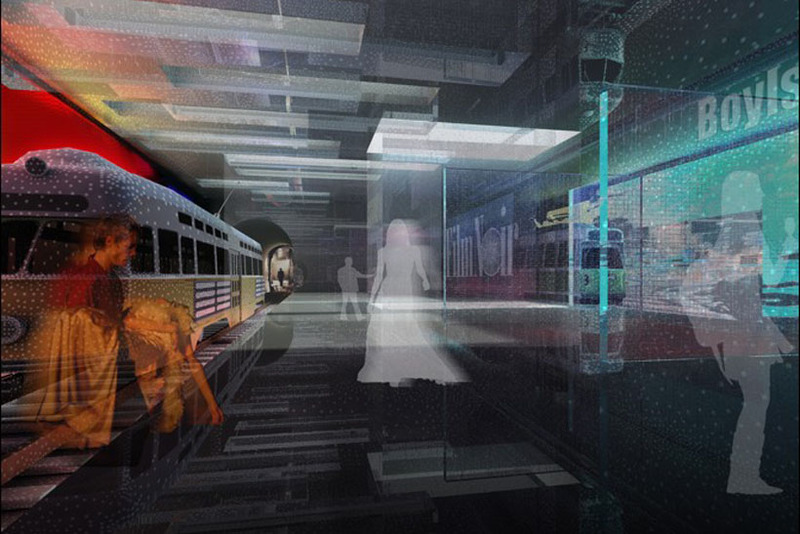 WHAT IF the abandoned TREMONT STREET SUBWAY TUNNEL became an interactive social environment? 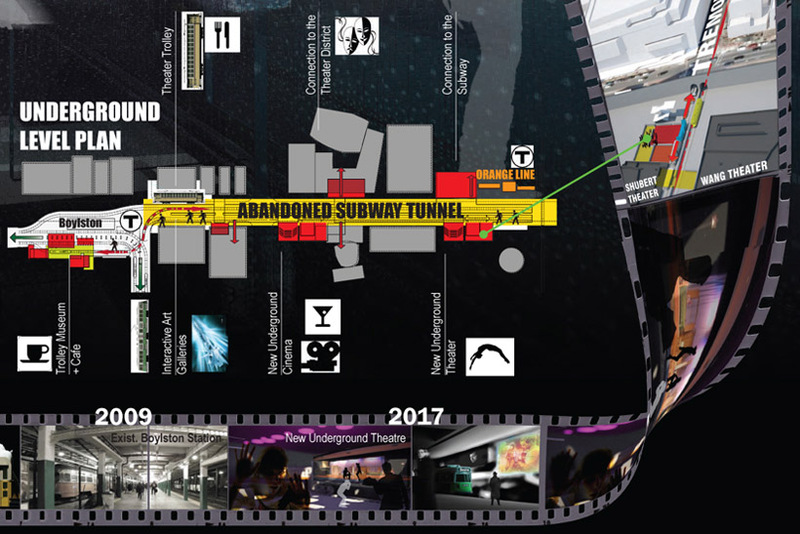 What if we shifted these contemporary urban ruins into a network of underground, interactive social environments--experiential theatres and immersive digital (art) galleries—while celebrating the past through a media-infused trolley museum inside North America’s oldest subway system? 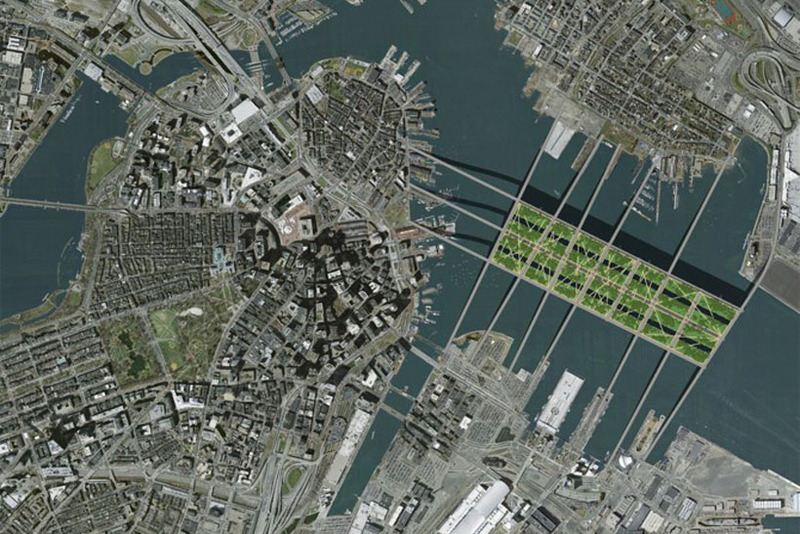 What if you turned Le Corbusier’s Radiant City upside down in Boston Harbor? 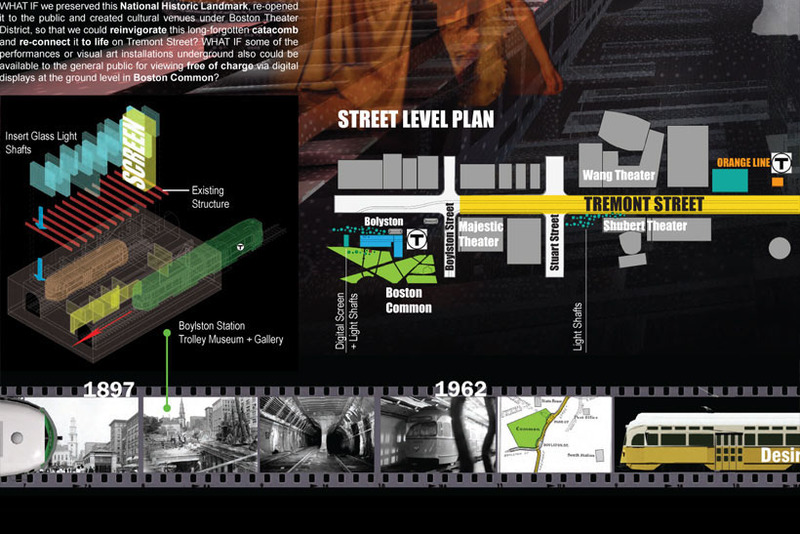 The flat top would be transformed into Boston’s own version of Central Park, with playgrounds, meadows and urban wilds, crisscrossed by a network of paths and overlaid by a grid of streets linking the city’s neighborhoods. Underneath would hang a new city neighborhood. 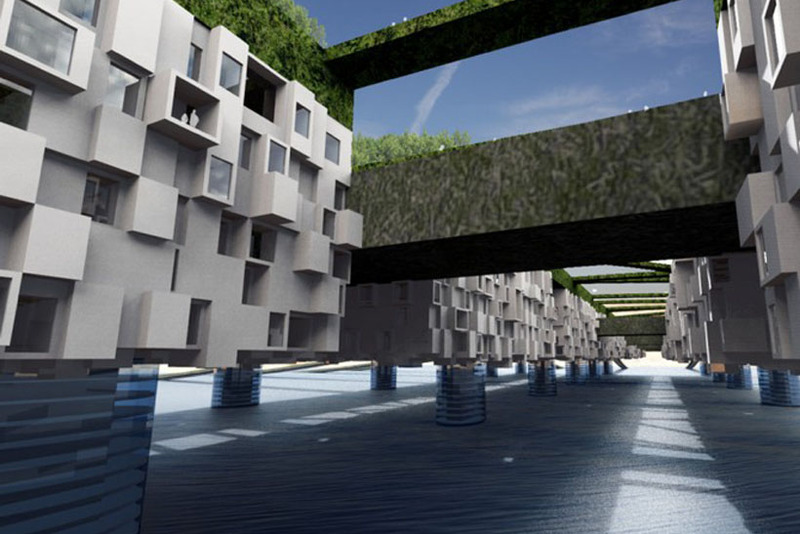 The entire urban structure would supported by “skyscrapers” reaching to the sea floor below. The site in South Boston is isolated not only geographically from the city by the highway but also socially from the people by the jail. 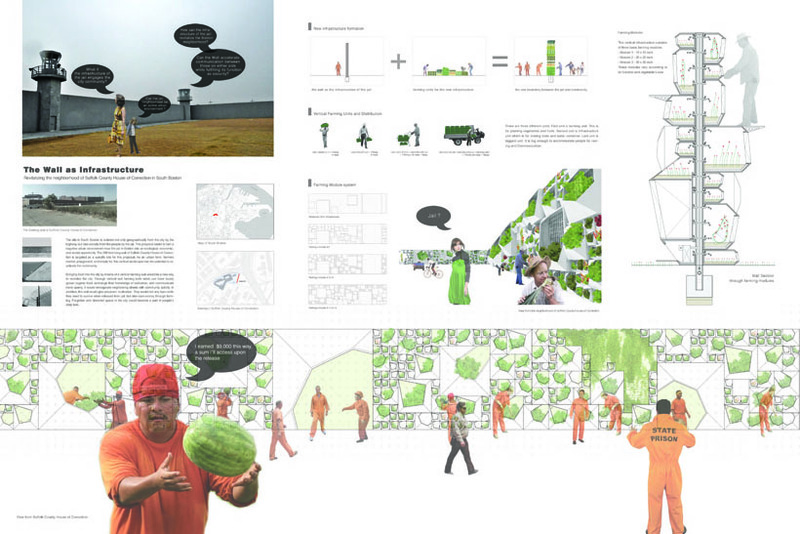 This proposal seeks to turn a negative urban environment near the jail in Boston into an ecological, economic, and social opportunity. 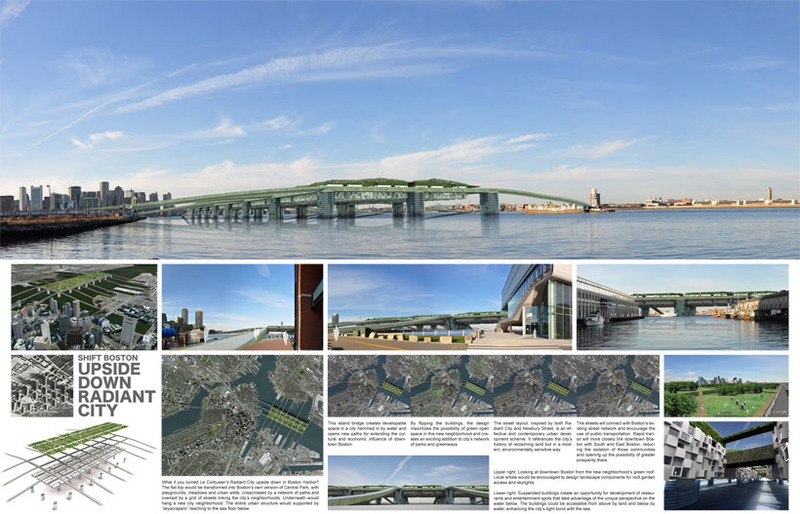 The 296-foot-long wall of Suffolk County House of Correction is targeted as a specific site for this proposal. 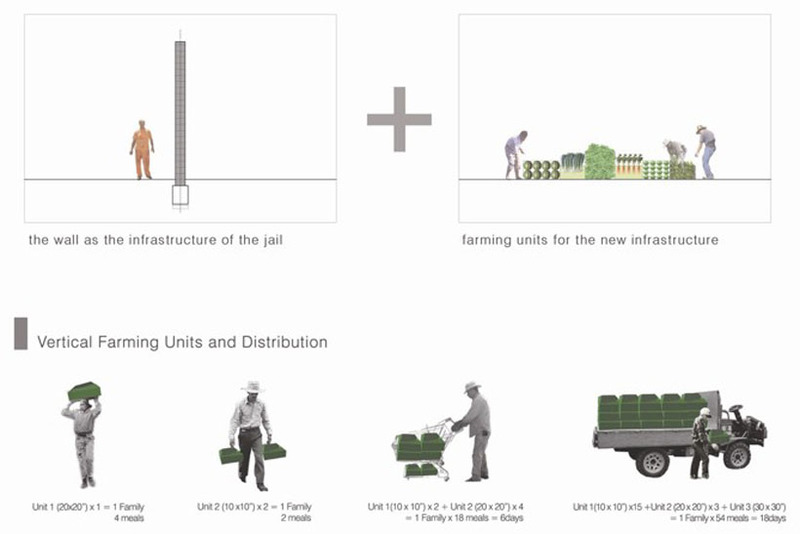 As an urban farm, farmers market, playground, and empty lot, this vertical landscape has the potential to reactivate the community. 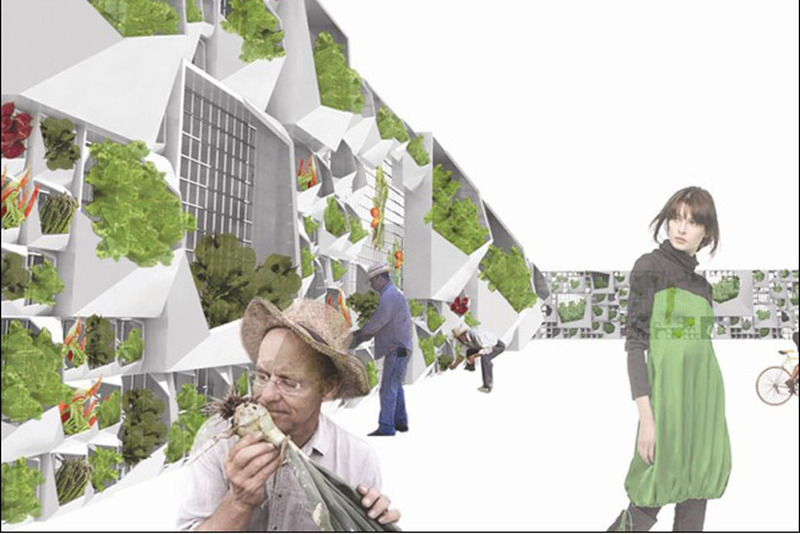 Bringing food into the city by means of a vertical farming wall would be a new way to revitalize the city. 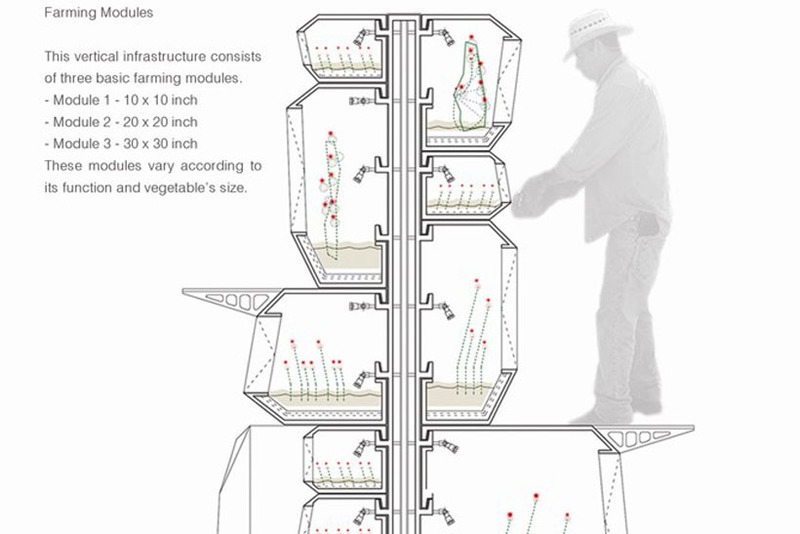 Through vertical wall farming both sides can have locally grown organic food, exchange their knowledge of cultivation, and communicate more openly. 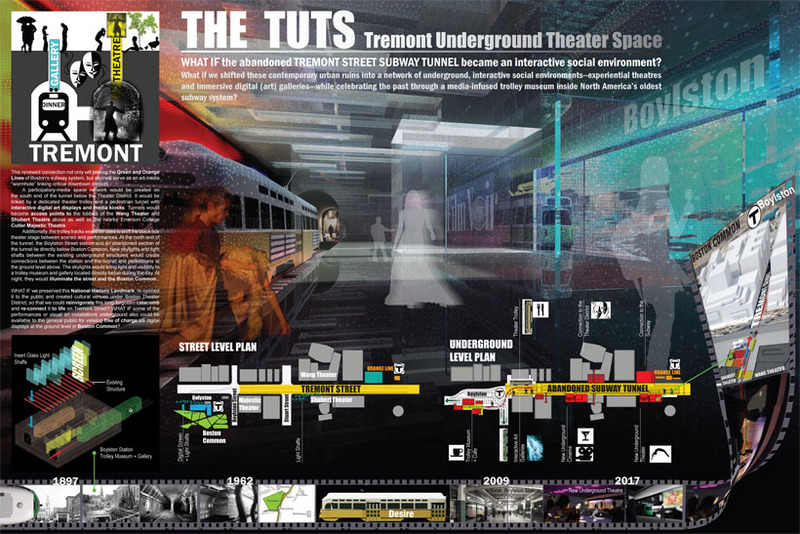 It would reinvigorate neighboring streets with community activity. In addition, this wall would give prisoners motivation. They would not only learn skills they need to survive when released from jail, but also earn money through farming. 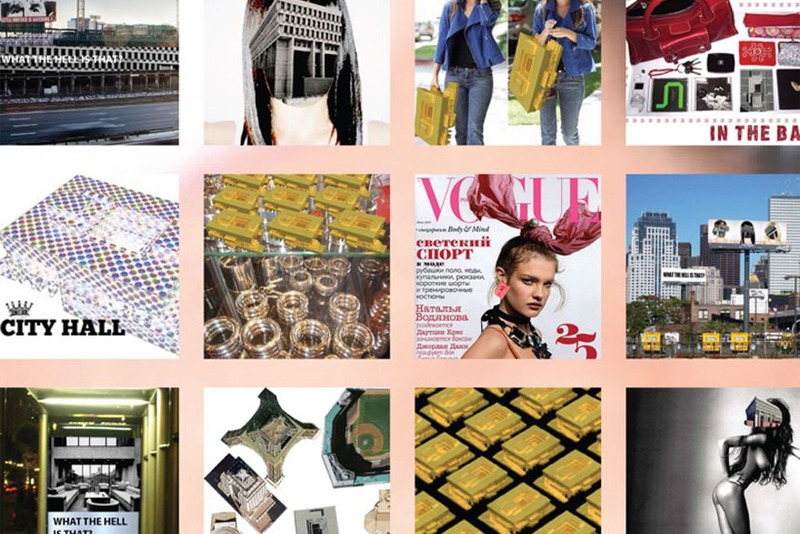 Forgotten and deserted space in the city could become a part of people’s daily lives. “In the 1960s, the city decided the designer of a new city hall would be chosen by competition. 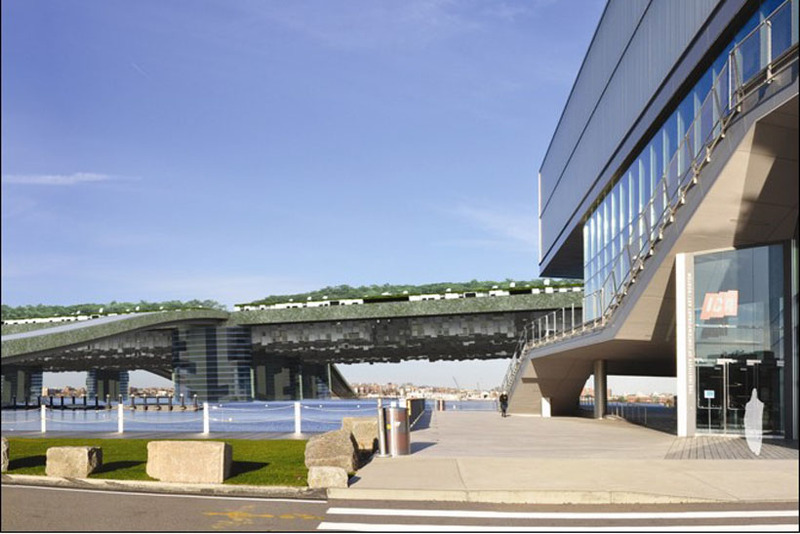 Four architects and three businessmen met at the Museum of Fine Arts, and after three days of judging, when a veil was lifted, the winning design was greeted by a few cheers, a few gasps, and a voice that said, ‘What the hell is that?’” Boston Globe, 2004. 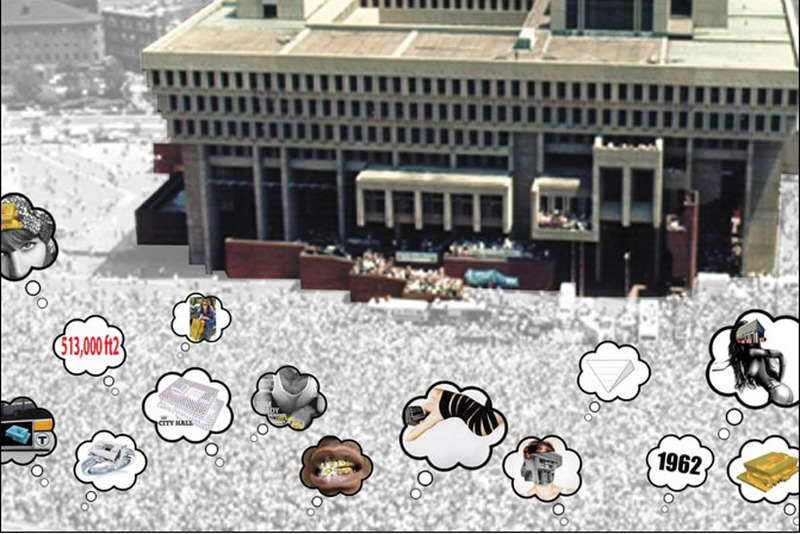 Sitting at the heart of the city, Boston City Hall was once voted the sixth greatest building in American history. Now, City Hall and its plaza are viewed as one of the least successful design projects in the United States. In WHAT THE HELL IS THAT? we maintain an ambivalent position toward City Hall’s architectural merits and shortcomings, but we engage it as a catalyst for cultural production. We see the potential of merging conservative government architecture with popular culture and propose that its future lies not with physically modifying or adding to it, but simply by transforming its image through association, replication, iconography, and information. Although of course aesthetics and practical concerns influence public perception, City Hall possesses a bizarre mixture of indeterminate qualities that can potentially swing back into the positive realm of public opinion, much like what has happened to brutalist buildings in other cities (e.g. Trellick Tower in London). 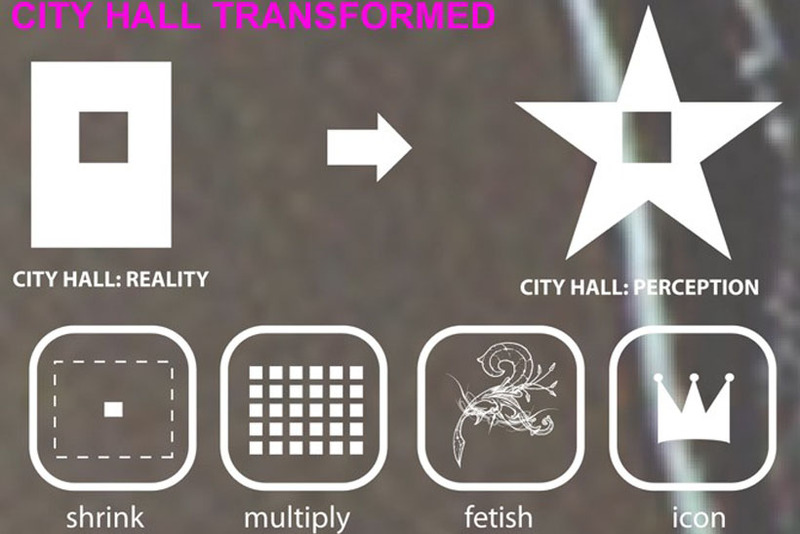 Through a series of image and artifact based interventions in Boston, we propose a makeover campaign that permeates through everyday life: miniature replicas sold in stores; billboards plastered with “Did-you-know” factoids, fashion designers accessorizing with it, and celebrities identifying with City Hall iconography. By reshaping and disseminating the image of City Hall as a building within the city it serves, we manufacture narratives, trends and myths which reshape the way in which people view it; what was once a place viewed with scorn, is now reconfigured with new associations, allowing it to take its rightful place within the changing urban landscape of Boston.